Here's what we are up to at the moment. We just got these new amazing photos by the amazing Paavo Lehtonen! Images here. 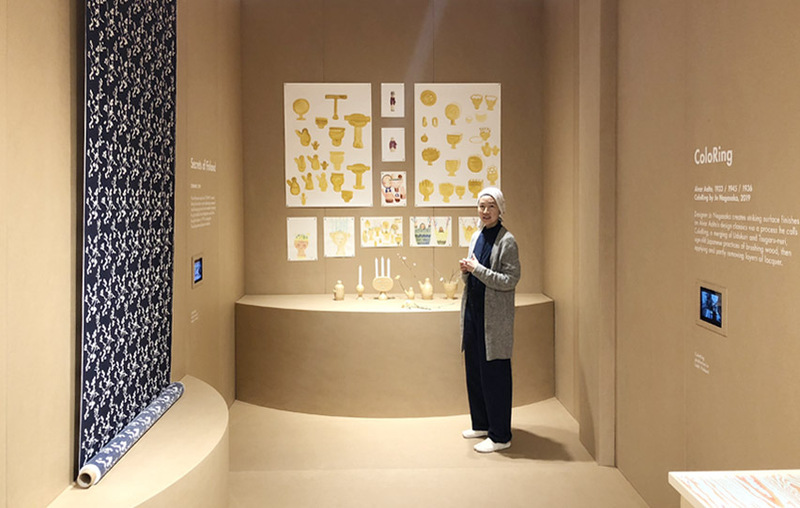 SECRET UNIVERSE at Designmuseum 5.4.-22.9.2019. Secrets of Finland by Company for Artek. 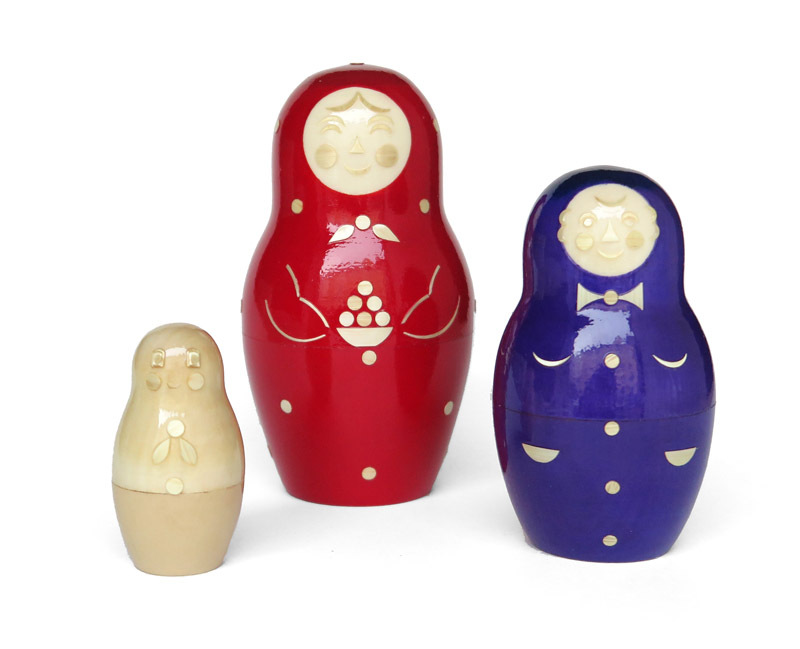 We designed a collection of six ceramic items celebrating Finnish festivities and beliefs. 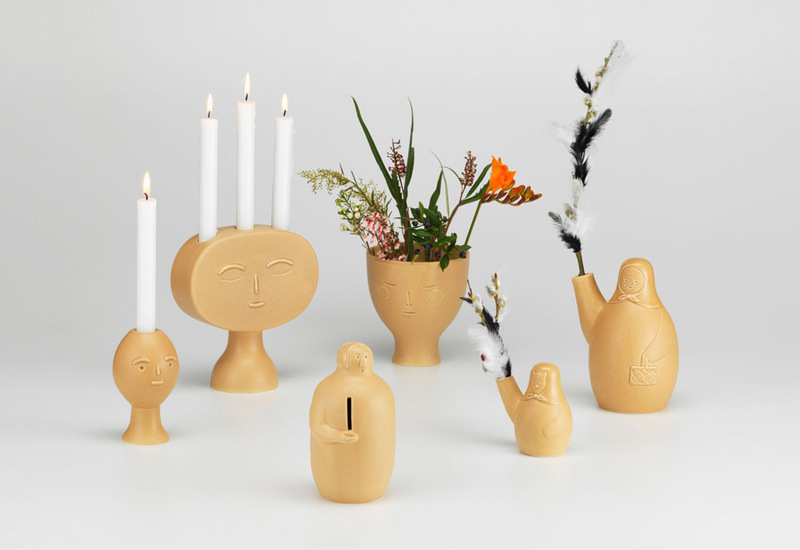 The Lucius and Lucia candleholders bring light to the dark winter. Pauper coin collector is based on a tradition of wooden paupers outside churches collecting money for the poor. The Midsummer Dream Vase is for the seven wild flowers one should keep under the pillow to meet ones future partner. And last is the Easter Witch with her dog who holds the decorated easter branches (virvontaoksa. Available in May 2019. We'll be in Milan for the launch of our collection Secrets of Finland for Artek. The collection is part of the FIN/JPN Friendship collection. Exhibition design by the ever-amazing Linda Bergroth. Join our breakfast talk on 10th Wednesday morning at 9.30. Via Lovanio 6. Secret Universe opening! We are so thrilled and deeply honored to have the inauguration of the exhibition by our hero, the amazing President Halonen! the 11th President of Finland (2002-2012) and first woman ever at the office. Secret Universe about to open. Visitors gathering to the temple. 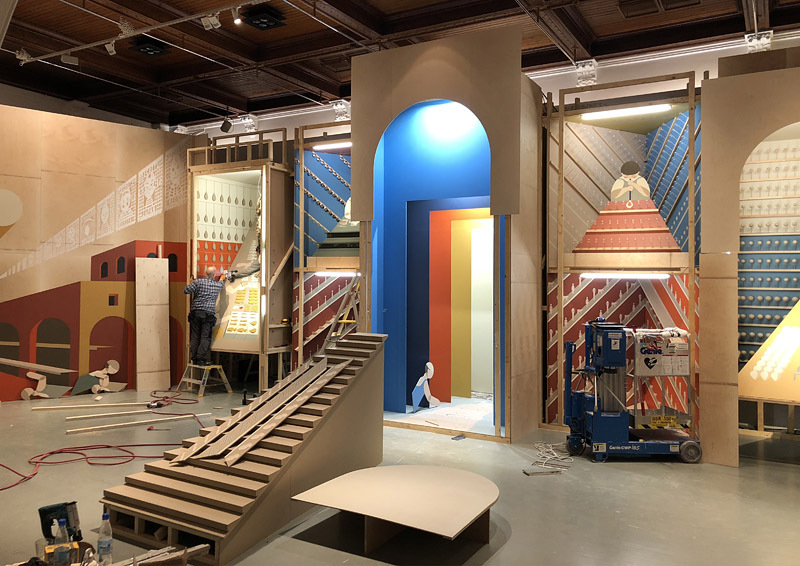 Company Secret Universe at Design Museum Finland from 5th of April to 22nd of September 2019. 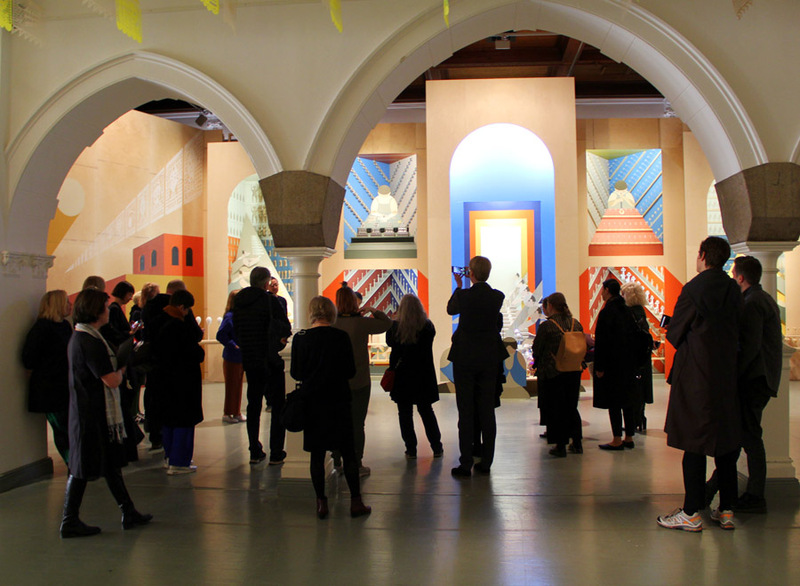 Company Secret Universe opening after tomorrow 4th of April at Design Museum Finland. Secret locations. Villages and homes of masters around the world. Company Secret Universe at Design Museum 5.4.-22.9.2019. Painting Russian village for Holy Temple. 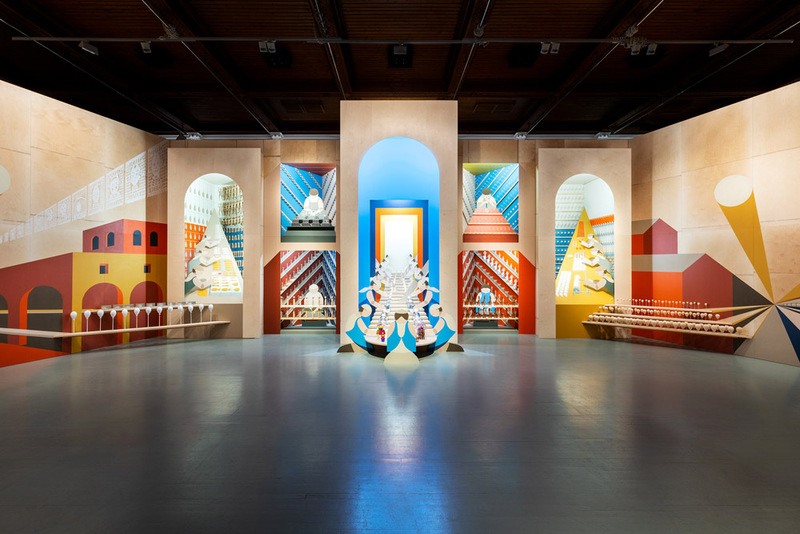 Company's Secret Universe opens at Design Museum 4.4..2019. 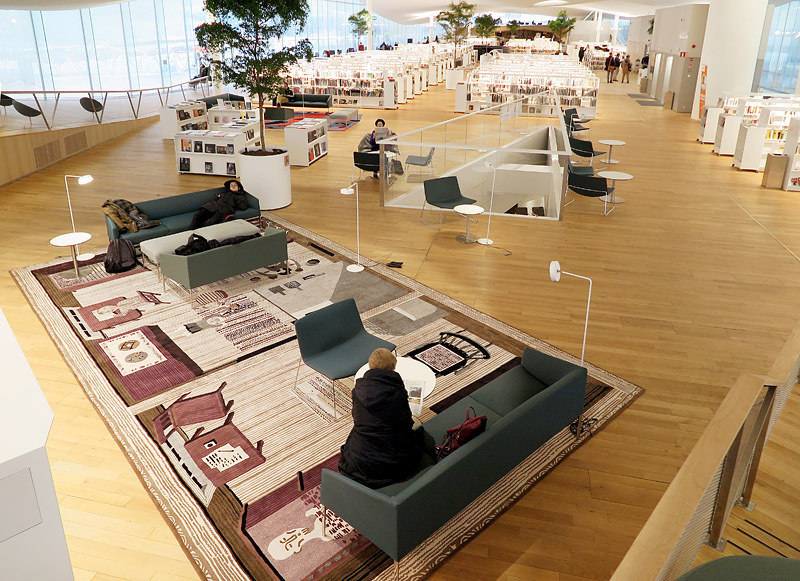 We designed a carpet for the new Central library Oodi. The carpet is one of the six art-carpets comissioned for the library. Ours is an ode to the late Finnish writer Aleksis Kivi (1834–1872). 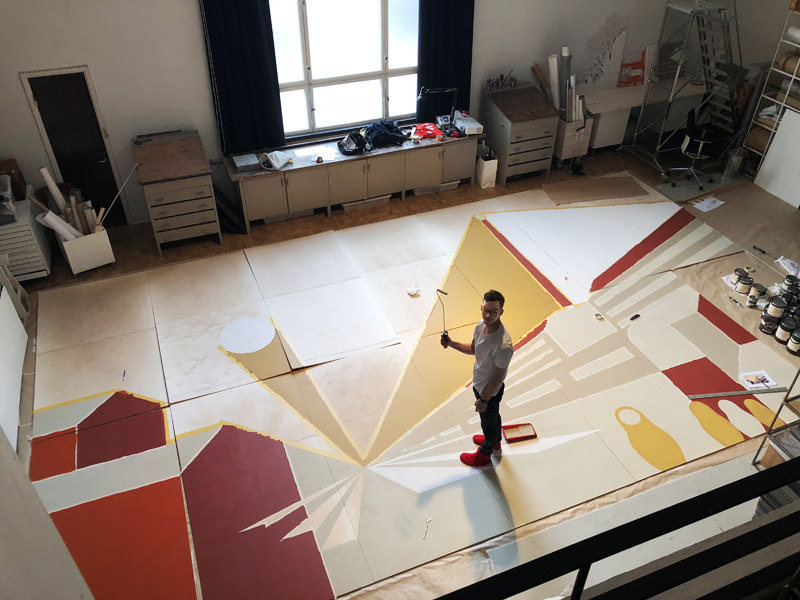 The base of our artwork was a tiny cabin where Aleksis Kivi spent his last year. 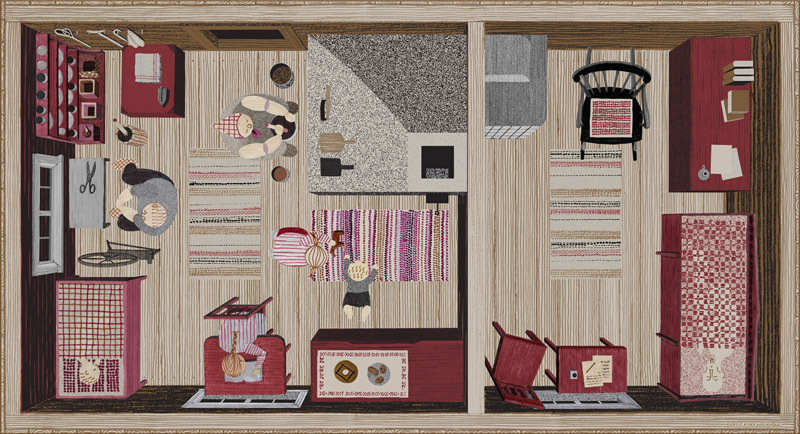 The cabin is reproduced in 1:1 scale in the carpet (3850 x 7300 mm). The library users can now walk in the cabin and experience the conditions of life in late 19th century. Aleksis Kivi shared this tiny cabin with his brother’s family of wife and four children. Meeting idols. 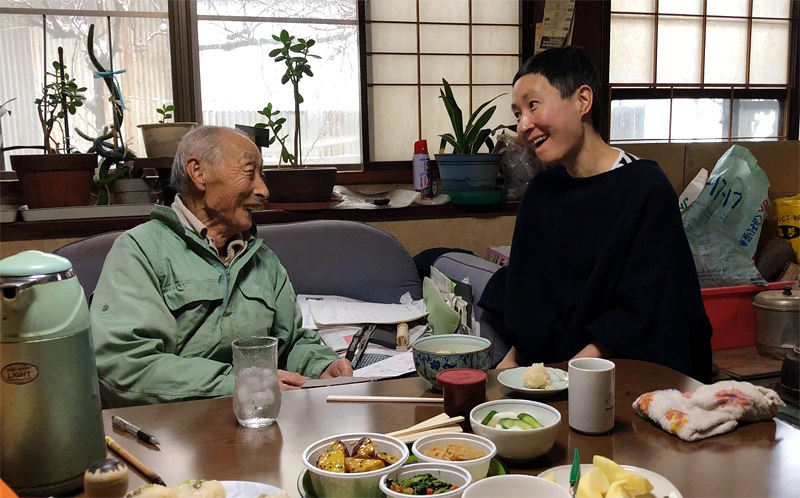 Aamu with Kokeshi master Igarashi-san, 93 years. We are working on a new project together. This and other new Secrets from Japan will be shown at our Secret Universe -exhibition at Design Museum in Helsinki opening 5th of April 2019. 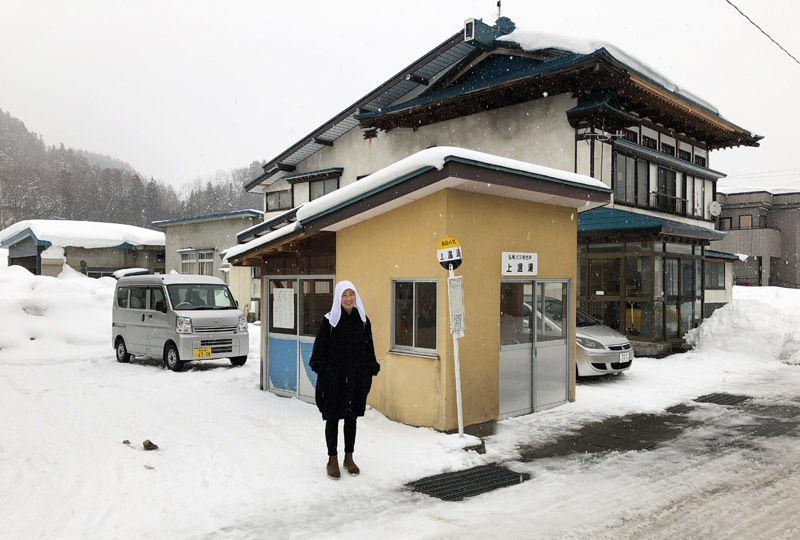 Snow storms and hot springs in Kuroishi, Japan. 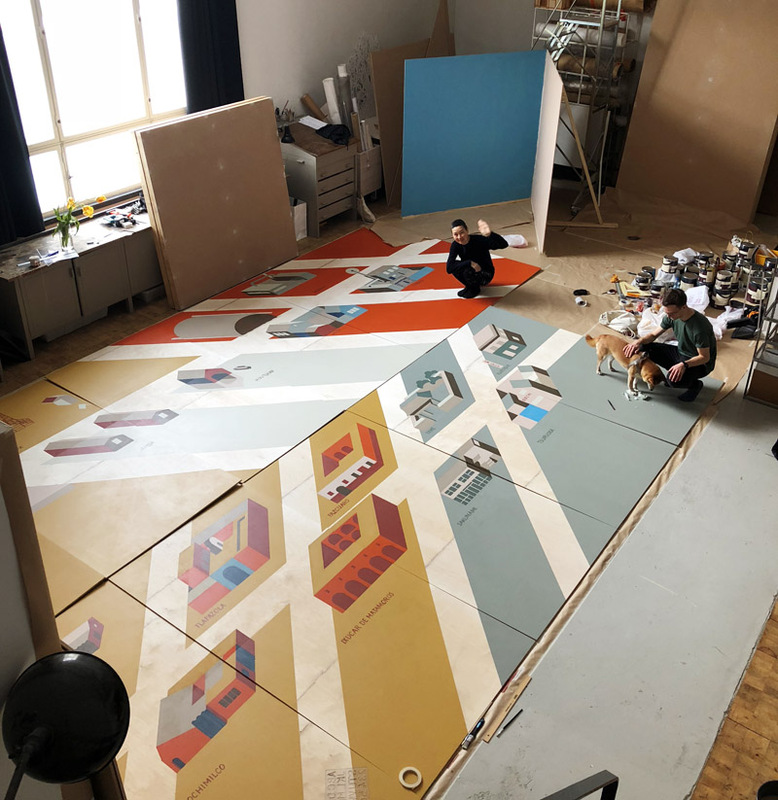 We'll be touring northern and central Japan visiting old friends and masters in preparation for our upcoming exhibition Secret Universe in Designmuseum in Helsinki.